Parents and caregivers should watch this video to see 6 sensory milestones baby should reach by the time they are 6 months old. The video contains 6 clips to show exactly what each one of the sensory milestones for 4-6 months old should look like. To see all of baby’s 4-6 months motor, communication, and sensory milestones, click here. Starting at 4 months old baby is able to do a lot more. Baby’s personality is starting to shine through and you are learning more about what sensory experiences baby likes and dislikes. 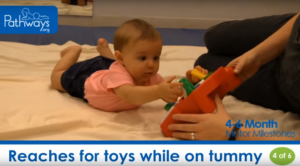 Between 4 and 6 months old baby is playing a lot more with toys and other objects. Baby may begin putting a lot of things in their mouth, but don’t worry as long as it’s safe or not small pieces. This is just their way of learning more about that object. Rocking baby, talking softly or singing are great ways to soothe baby at this age. Visit our sensory toolkit to learn more about sensory development. If you notice baby is not reaching any of these milestones talk to your pediatrician or healthcare provider. Use our checklists and bring them to well-baby visits to help bring up potential concerns. Did you know there are actually 7 senses? Learn about all 7 and how we use them together every day. You can watch baby’s motor milestones too! See what motor movements should look like at 4-6 months. Find all of baby’s developmental milestones, sorted by age.